This month has been a tough one! No, i'm not going to moan about any of my personal problems as i'm sure you won't want to hear them, but damn, have we been busy! 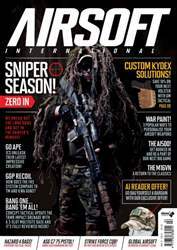 What with Airsoft Showcase taking place this month and plenty of Bank Holidays too, it feels like there have been too few days in this month this time round. Despite it being a lovely month in terms if weather i've not actually had the chance to pick up a gun and use it in anger… yep, that's a rare one, absolutely no skirmishing for me this month at all. I'm sure you all have plenty of sympathy though, right? So, what's in this issue? Well, unfortunately there's a little bad news if you were looking to see how we got on with the Recoil SCAR-H DMR project. We finally received the last parts of the build this morning but the problem is, even taking it right down to the line, we need to get this issue printed. There just wasn't enough time to get it all done properly and it's not the sort of thing that needs rushing. On the upside though, you'll find we have switched the feature out with a compendium guide to painting your guns. It's one of the most common questions we get asked so we decided we might as well collate our favourite techniques into on bumper guide. 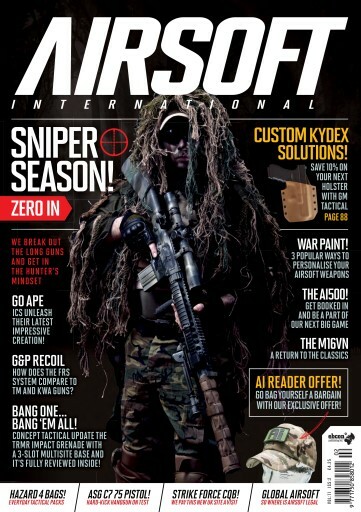 We also have articles like: Friendly Fire, Reader offer, Hazard4 Bags, Strikeforce CQB, The M16VN and much much more in this months Airsoft!